Pin It As planners, we are responsible for not only finding the best, most reliable, quality vendors, but we are also responsible for keeping a couple on track for budget. We are working with a few vendors over the next few months to help explain where costs come from. Watch for the images on Facebook for "How much does it cost?" and the answers will follow the next day on our blog. Guess on Facebook, and you could win a Gift Certificate to one of the vendors for products or services! Today's gorgeous bridal bouquet is from Coby Neal at The Flower Studio. 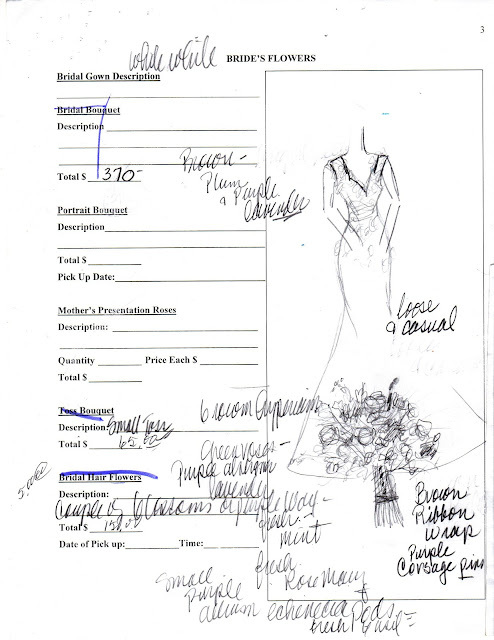 Throughout consultations, The Flower Studio makes very detailed sketches and list each of the flowers that will be used in the bridal bouquet and accompany them with a cost so the bride knows precisely what she is receiving. Flowers are ordered 2 weeks prior to a major event. They are received at their Studio four days prior to the event, processed with H2O and a floral preservative, refrigerated and then used in design. Prices of fresh product may fluctuate according to the season and the supplier. The designer labor cost is a percentage that ranges from 20% to 35%. (35% is industry recommended.) This bouquet took approximately an hour and 20 minutes to make. After the design was complete, it was sprayed with a floral wax to help the flowers retain freshness and finally, carefully packaged for delivery! This bouquet is composed of approximately 92 stems of flowers! What was your guess? Rachel guessed $372, and Keri guessed $373!